Work stands are not only for bike shops. Every home workshop needs some kind of work stand. For most work on a bicycle, the wheels need to be off the floor so they will spin, and the parts being adjusted or replaced need to be at a convenient height. Do not rest the bicycle upside down on the saddle and handlebar. This can cause damage, there are many bicycles it can't hold steady, and most parts are too low down for convenient access -- see comments by Jobst Brandt. A work stand can be a simple as a single hook threaded into a ceiling joist. This is possible even with a finished ceiling, by tapping it to locate a joist under the plaster or drywall. The bicycle is lifted up and over, so the end of the hook goes between the saddle rails ahead of the seat post. Large hooks padded with soft plastic are available at better bike shops and serve this purpose handily. 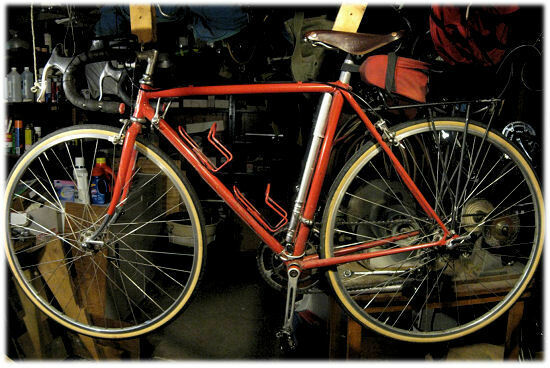 A bicycle hanging from such a hook is at a convenient height for a person of average height to work on the wheels and drivetrain. The bicycle is returned to the ground, resting on its wheels and leaning on a wall or its kickstand for work on the seat post, saddle and handlebars. A somewhat fancier arrangement uses two hooks, possibly with ropes; clothesline works well. Below is a photo of the work stand in Sheldon Brown's basement workshop. He used lag screws (large wood screws with hex heads that turn with a wrench) to bolt two lengths of 2 x 4 lumber to the side of a ceiling joist. 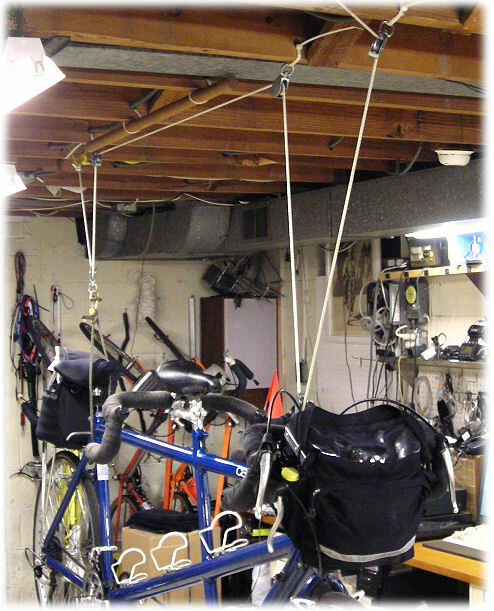 The 2 x 4s can be rotated to fit any bicycle, or up into the ceiling when not in use; the lag screws are tightened just enough so friction holds the 2 x 4s in place. Washers under the heads of the lag screws prevent wear to the 2 x 4s. Small screw-in hooks at the ends of the 2 x 4s support the saddle and stem. This is a stitched panorama, shot under tight conditions. Randy Swart sent this photo of his home-made tandem work stand. (the kind used to moor a boat, not the kind on a cycling shoe). A commercial version also is available. A floor-mounted work stand is essential for an apartment dweller, or anyone who doesn't have the liberty to screw hooks into the ceiling. The cheapest you can go is a simple display stand that supports the bicycle under the bottom bracket and hooks over the down tube. A display stand is very compact to store, but a bit tippy and holds only one wheel off the floor at a time, see-saw style. You may have to place a load at the front or rear of the bicycle so the wheel at the other end will stay off the floor. A proper commercial work stand rests steadily on a tripod or weighted base, or it may attach to a wall or workbench. It has a pivot so the bicycle can be tilted with the front or rear wheel higher. The bicycle may even be rotated completely upside down for a few tasks such as driving the top headset race out of the head tube. Most commercial work stands have a padded clamp to grip the top tube, seat tube or seat post. Be careful not to clamp over a cable, water-bottle boss or other protruding fitting, or you may dent a frame tube. The clamp can crush a carbon-fiber tube -- a couple of thousand dollars' loss with one dull, hollow "crack". Clamp the bicycle by the seat post instead. If the seat post is also of carbon fiber, replace it with a metal one before lifting the bicycle onto the work stand. 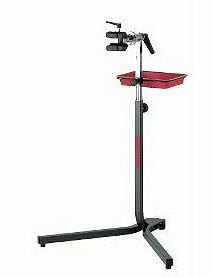 There is a wide variety of work stands, ranging from simple, compact, folding ones intended for home use, to heavy, weighted ones for professional shop use, with a tool tray and quick-release clamp. Work stands are available through better bike shops. You probably don't want to carry a work stand with you when you ride. Many repairs, and even wheel truing, can be done with the bicycle lying on its side. Again, avoid turning it upside down. Laying the bicycle on top of a table with one end of the handlebar dangling over the edge allows the front wheel to lie flat and spin freely. Or look for a tree with a low branch to hook the nose of the saddle over, and become a shade-tree mechanic. If you carry a length of clothesline or nylon cord, you can use a higher branch.